Age Of Gladiators is a single-player strategy/business management sim set at the height of the bloody gladiatorial games in ancient Rome. Hire scouts to scour the provinces for potential prospects – once you have recruited your gladiators, you will need to manage their morale and personality while equipping them for battle in the arenas. 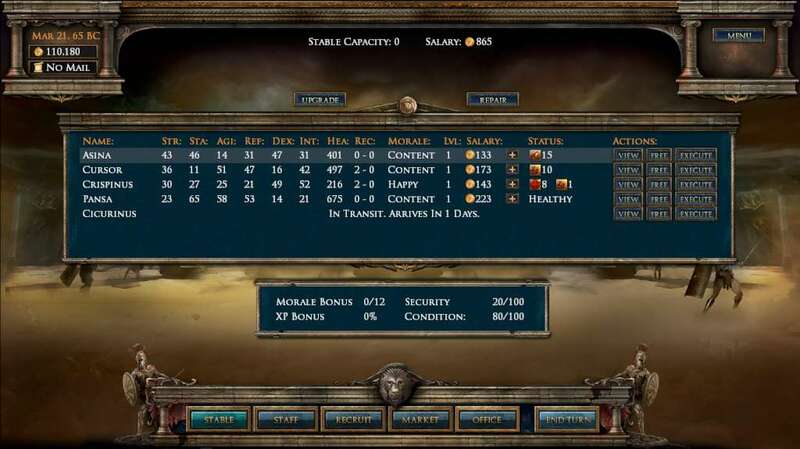 Recruit support staff, upgrade your stables, partake in side missions, and manage the wealth and reputation of your business as it grows each day. As your fighters win battles and increase in level, it will be up to you to decide how to focus their abilities by spending attribute and expertise points. 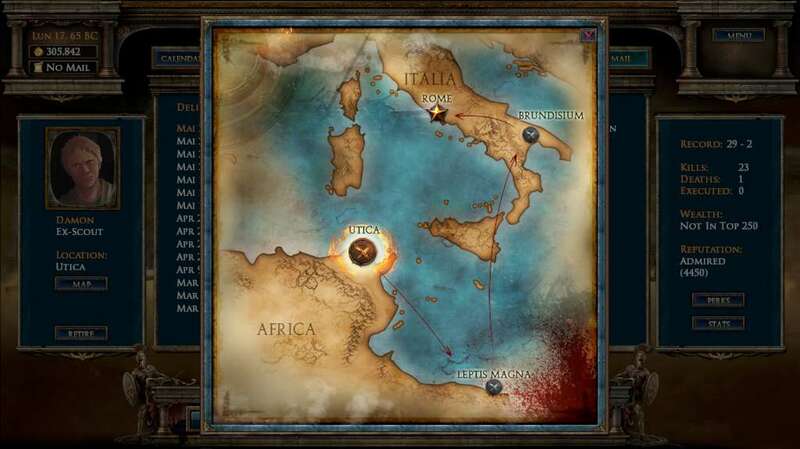 Compete, trade, and interact with other in-game bosses as you work your way up from the starting provinces in Africa to the grand coliseum of Rome herself! 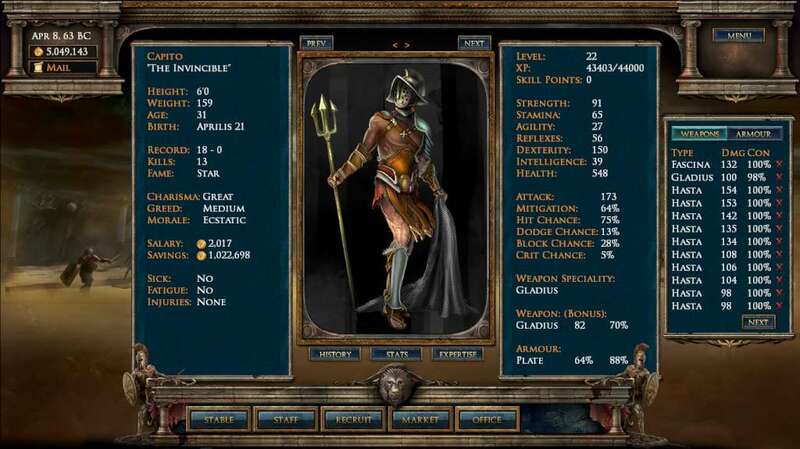 Gladiators are born with their own dynamically generated attributes (strength, agility, stamina, dexterity, reflexes, intelligence, and health), weapon specialties, and personalities. It is up to you to hire scouts to locate the best prospects available for recruitment. Manage your stable of gladiators carefully – their morale, greed, injuries, fatigue, and more must be taken into account before sending them to battle. The physicality of your gladiators will increase or decrease with age, depending on if they are in their prime or declining. Fame system: as your gladiators gain glory from battle, they will become more widely recognized and adored by the crowds. Win enough battles and they may even get voted into the gladiatorial hall of fame after they retire (or die). Watch as your fighters climb the all-time records list for wins, kills, and fame - all held by retired and still-active legends in the arena. 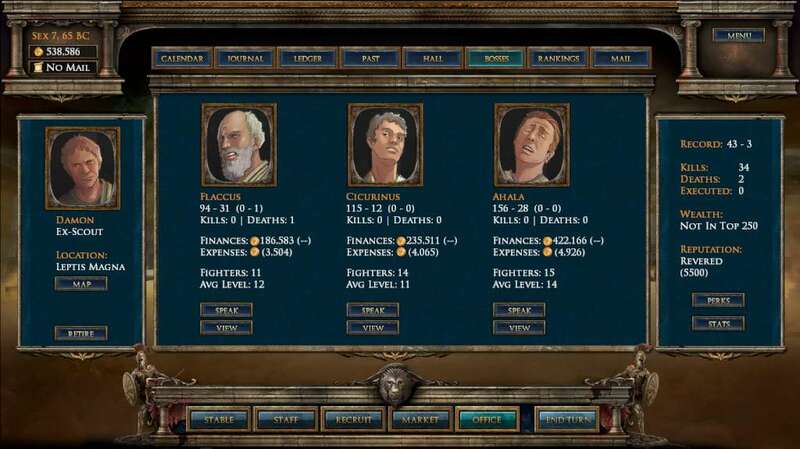 As your gladiators level up, they gain points to spend on their attributes and expertise. 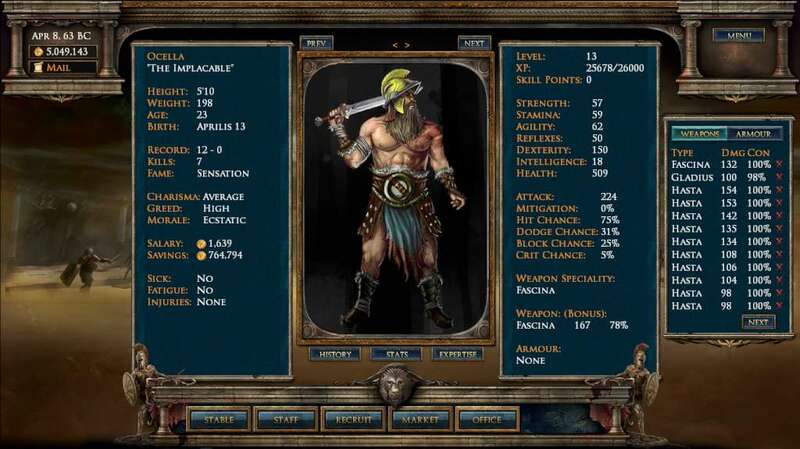 Expertise allows you to build and customize your fighter according to their appropriate strengths. Purchase, sell, or trade fighters with opposing bosses. Rob treasuries, kidnap enemy fighters, assassinate your debt holders and more with the quest system. Increase the odds of success by sending gladiators on the mission as well. Search for deals on weapons, armor, and money loans on the marketplace. Hire staff such as scouts, doctors, trainers and blacksmiths to help your gladiators achieve victory. Your staff will gain experience each day they are employed. Upgrade your stable by improving its food, bedding, shelter, and more. Strive to become the wealthiest individual in the entire Roman republic. There are quick and underhanded ways to make money, but your reputation and fighter’s morale may suffer as a result. Receive taunting letters from opposing bosses as well as various other messages from your fighters, staff members, and different characters as you progress through the game.